The one element we have on our side is that thus far 2016-2017 had blessed the Colorado Plateau with an above average snowpack. In fact, with a warming trend touching the sixties forecasted for the week ahead and a snowpack of 185% at time of launch this drainage was in rare form to extol its liquid wealth to those with enough flexibility in their schedules to jump at moments notice. In the waning light of day - around 4:00pm - the electric pump revs to life as cold heaps of rubber gradually transform into four small boats. Fully inflated and set against the backdrop of a haggard looking “stream” the absurdity of our task is now wholly apparent. My friends, who’ve done this very same trip in ritualistic fashion year after year, assure me that all will go according to plan but I am far from convinced. As dry bag after dry bag is strapped down I catch shafts of light reflecting off a hallmark of the conventional river trip - the propane bullet. “Jesus,” I think to myself. The late afternoon light slips out of the canyon illuminating only the highest crimson escarpments as we shove off. I decide to bring up the rear, thinking I will earn my keep by assisting in the task of disengaging rubber from sand when I glance at the shore astounded to see that we are in fact floating in the correct direction. Peering ahead I see the lead boat disappear around the corner, gliding atop a silty opaque current. “What?” I ask to no one in particular. Before I can fully comprehend this new reality - my very concept of place shattered - we pull out on a sandy beach on river right. The photo period being what it is, darkness is not far off as we hurriedly erect camp, which includes three tipi tents heated by lightweight breakdown aluminum wood stoves and a full kitchen complete with two burner stove, Coleman oven, and of course at the center of it all, what no true river trip can do without; the white propane bullet. My faith in the gospel of austerity is again tested that night huddling over my half working backpacker stove - temperatures plummeting as my stomach turns with the thought of the plastic wrapped five thousand ingredient meal I am fated to consume. Glancing over at my companions I catch them joyfully conversing as they pull warmed sweet potatoes from the oven while dividing spoonfuls of simmering real ingredient gumbo into their bowls. I am obviously missing something here. This is not how this river is supposed to be experienced. Exuding a wavering confidence in my choices I finish supper and bid adieu. A new day, a new month. Spring still somewhere far on the horizon. Gathering a few pieces of kindling to feed the small fire I listen out for a faint crackling as I await the characteristic draw of the stove which heats my shelter. It is well before dawn and soon the walls of my tent begin to sag with soppy moisture as a thin coat of ice thaws, beading into small pools before streaming to the ground. I place pot atop stove, ready my coffee and decide to forego reading from Loren Eisley’s “The Star Thrower” as I sit back and prepare to rendezvous with that most rare facet of modern life; free time. My schedule is all too pressing - the morning agenda consumed with the solitary task of awaiting the rising of the new days sun. After a few hours first light breaks the rim and I abandon my heated abode. Legs numb from sitting I strike out, unwinding a dry wash behind camp I ascend in a frenzied state of anticipation for morning sunlight. Finding a comfortable perch overlooking the river I see lazy coils of smoke wafting from the other two tents as the muffled din of conversation echoes off the large sandstone wall opposite where I sit. Basking in my thermal good fortune I reflect on the paradox of being here now. Once satisfactory amounts of UV radiation blanket our beach - around noon - we resolve to break camp. Equipment is re-dry-bagged and the tetris like task of rigging boats commences. Shoving off, we begin again the arduous task of floating south in Huck-Finn like fashion. 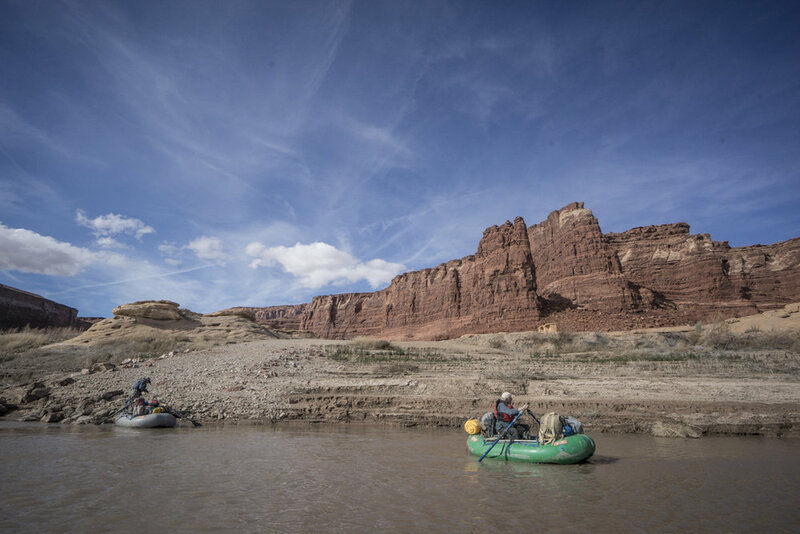 The languid pace of the river carries us around one bend then another; billowing piles of gear a direct affront to the lean economy of the surrounding landscape. The current method of travel calls into question our species infatuation with efficiency as we wind back and forth, in and out of massive overhung alcoves following a meandering course. Instead of praising efficiency, demanding proficiency I absorb a lesson in deficiency. At the arc of one bend, the river bank is so recessed as to receive but a few precious minutes of sunlight per day leaving the river hissing as grainy currents flow beneath a defiant peninsula of ice. The canyon country around us continues to uplift, twisting and contorting it folds in on itself in jagged chaos replete with a vivid menagerie of golds oranges and reds. In a few spots it becomes necessary to dust the oars off in order to guide the boat around rocks sprouting up from the riverbed. To call it rowing would be generous. With each stroke the oar blade exudes a hollow thud as it comes into contact with the packed mud of the river bottom, the blade only ever being half-way submerged. Far from graceful it gets the job done. 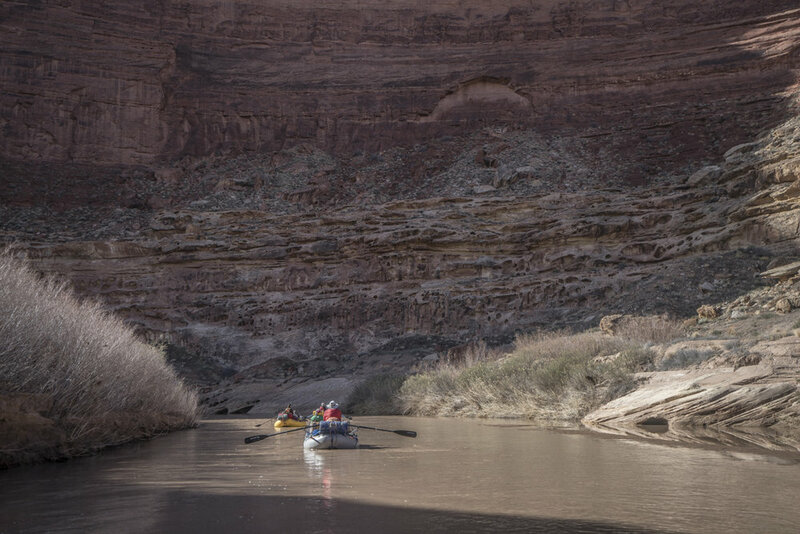 Around three thirty in the afternoon we pull into camp at the juncture where two side canyons briefly collide before spilling into the river from the east. They are the last large named complexes before the confluence with the Colorado. The trio I travel with, John, Pik and Steve all hail from western Colorado and have been plumbing the depths of this country for the better part of three decades. They are a library of information - routes in and out of the various side drainages, water sources, remnants of the ancient ones. And while just a dime sized chunk of the wrinkled topography comprising southern Utah they are enlightened enough to realize one life is not near enough time to see, feel, or experience it all. For them, returning year after year seems less an escape more a way of life as they share in the trait of a perpetual migration like those that occupied this land long ago. I admire their love affair with this largely neglected gem. This trip marks my fourth outing and I’d like to think in thirty years’ time I too will be returning in a quiet quest to unravel the intimate depths of a landscape that defies clear interpretation. The following morning we shove off in the face of a blistering up-stream wind. The small boats are blown from one bank to the other as we approach a shallow set of minor rapids strewn with rocks peeking above the surface. We pass one another in leapfrog fashion searching for the path of least resistance. To take the lead is to assume a sacrificial position, a bumbling martyr you put it all on the line, you're stranded fate (absolutely certain) a clear message to all your followers to choose a different course. No longer daydreaming we’re all forced to be in the here and now - the present - as we assess the coming channel in hopes of not getting pinned. Finding a spot to place my luke warm beer I envision myself as mystical Guru extolling the spiritual quest for presence of mind uniquely found here on the Dirty Devil. My disciples could even pay extra to leave their cell phones, ipads and wifi at home, undertaking an ascetic “silent retreat” as they seek to attain some form of shallow water induced Nirvana. 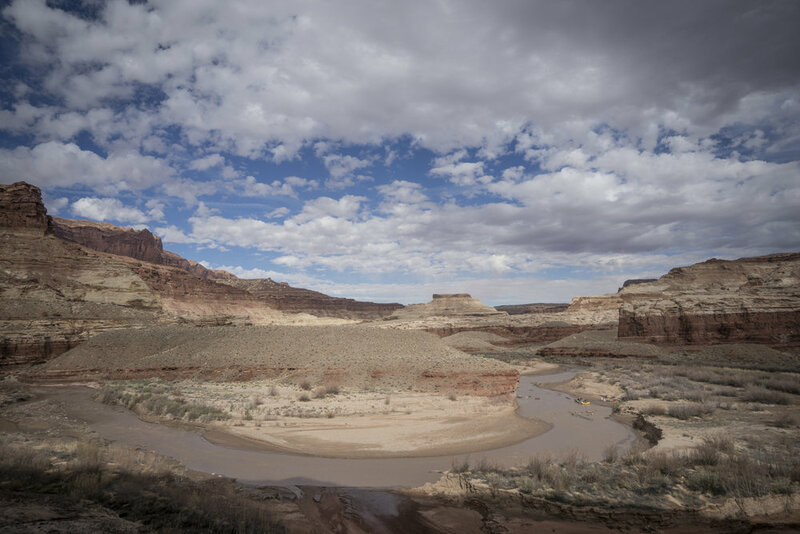 Eventually the wind abates in the early afternoon as we reach the upper remnants of what was once “full pool” - the demarcation or high water mark of a once full Lake Powell. The river here is strangely silent as it narrows to resemble a drainage ditch bound by tightly packed muck there is an air of lingering sterility. In the void I hear the sounds of a confused river struggling to return to its original state as it re-carves a channel through accumulated sediment. If rivers have memory I wonder, can this one reach back millions of years to draw on original intent? Conjuring up some distant recollection, the slow whittling away of bedrock itself, the carving of massive canyons over epochs, is there some committed resolve which can arise again? Something innate that was forged in the crucible of deep time….. I drift by a few sections where rain fueled mega-flows, occurring year after year the progeny of violent summer monsoons have cleaved away all remaining debris uncovering sandstone glowing with an implied authenticity. I come to this conclusion - it will take much more time than I have left on this earth but there will come a day when this canyon is restored. My mind drifts to some emotional purgatory; heartbroken by what I see while optimistic in what will pass after I am gone. I think about John McPhee’s “Encounters with the Archdruid” in which he recounts environmentalist David Brower’s confrontations with his ideological adversaries. 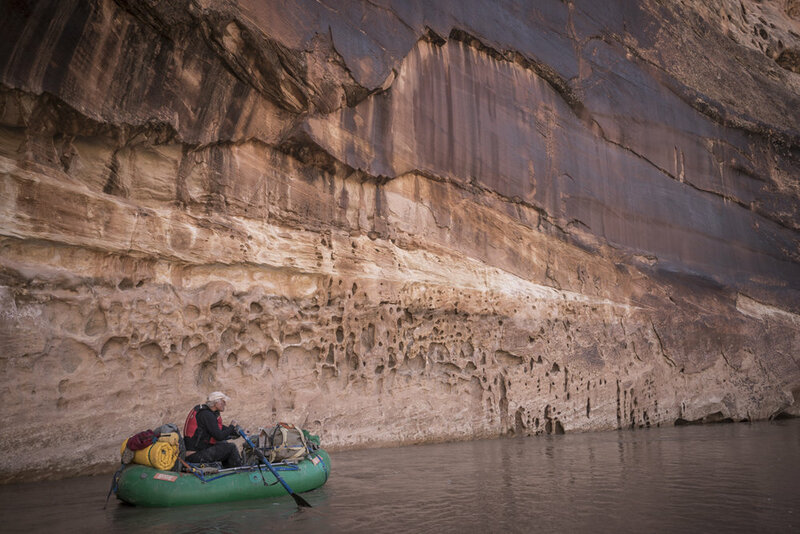 In one part of the book McPhee writes about Brower floating the Colorado through Grand Canyon with Floyd Dominy, former commissioner of the US Bureau of Reclamation in its Glen Canyon dam building heyday who seems to relish his legacy. In the book Dominy is fiercely protective of his contribution to what he deems progress as he and Brower trade ideological blows in their time together below the dam. I can’t help but wonder what Dominy would think sitting in my boat today, for it seems easy to believe in an easy win when not directly confronted by the deep scars that have been born out above the dam as Lake Powell recedes. 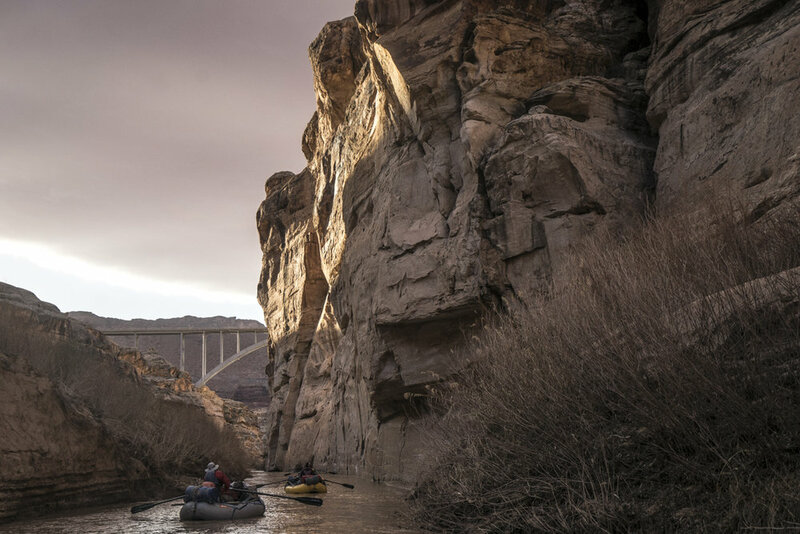 Having passed beneath the Utah State Route 95 bridge we make our final camp in late afternoon atop a small spit of sand two miles above the confluence. Parked below the highway we occasionally hear the sounds of passing cars bound for the metropolis of Hanksville to the north. The reality of reentry slowly creeps back in. Work, bills, Donald Trump all await just a few miles away. I am not yet ready to relinquish my embrace with this wilderness but know that it is destined to occur. I look out on the meager river in front of me draped in moonlight flowing stubbornly south despite all our incessant meddling. I think of another time, decades past, one where tomorrow I could have turned the corner, resupplied my trusty steed at the small Mormon outpost of Hite and cast off for Lee’s Ferry. The world it seems was different then, somehow more innocent. At least that’s what I tell myself. The truth is, had I known this place pre-dam I would likely not be here now post dam. Too painful. I find solace in this thought, sharing the unseasonably warm night with friends as we imbibe on boxed wine and eat real food made in a Coleman oven heated by a white propane bullet. Early morning riverside. We wear the groove of routine; stove lit, coffee boiled, camp broken. A canyon wren pierces the morning silence and below my tent a pair of beavers are beavering, perhaps having found inspiration in our concrete contrivance wedged into the sandstone downstream near Page, Arizona. Maybe Spring is closer than I think. We stay in tight knit formation for the remaining miles above the confluence. The river is very much in flux here near its delta as braided channels clogged with wood brought down by flash floods make for keen navigation. At one point we round a left hand bend and Steve promptly pulls his small green pickle like craft to shore. 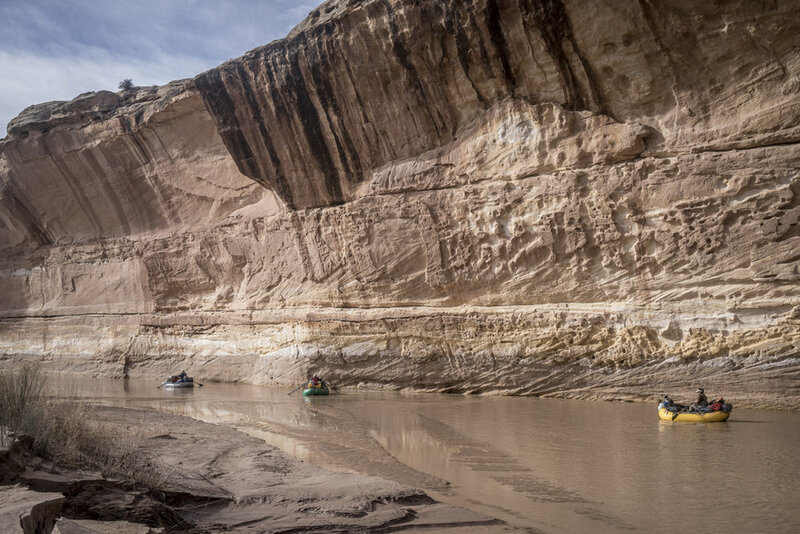 I follow as I spy a small canyon roughly eight feet tall of sheer sediment rise up from a river that has narrowed to six maybe seven feet wide just downstream. John, Steve and I hike ahead above the river and conclude it would be wise to line the boats. There are no rapids within the confines of the silt laden gorge but the width poses a problem for our clunky oars. After an hour or so all three boats reside downstream of the impediment and we shove off again bound for the confluence. A short time later I say goodbye to the our river as it dissolves into the now free flowing Colorado near Hite. It’s instantly a shock, the sheer size of the Colorado after having traveled such a diminutive river for the last four days. I look up canyon to spy the yawning abyss of Cataract Canyon petering out as we reach the take out. Slowly boats are unloaded, each person's gear subdivided into their respective pile and I am again struck by the sheer volume of our cargo. At least this time, set against the Colorado it seems proportional.